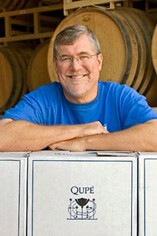 Bob Lindquist turned a one time hobby into a full-time job when armed with a small bank loan he established Qupe Vineyards at Santa Maria in Santa Barbara Country. Today he produces 20,000 cases a year with all the wines being made at the same winery as those of Au Bon Climat. 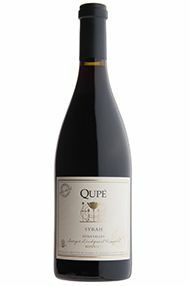 He produces 3 different bottlings of Syrah - Central Coast, Los Olivos (blended with 40% Mourvedre) and Bien Nacido. Lindquist specialises in Rhone-style wines but aslo produces superb Chardonnay. The Bien Nacido Cuvee is a deliciously rich and aromatic blend of two-thirds Chardonnay and one-third Viognier. In 2015 Bob Lindquist received the Lifetime Achievement Award from the Rhone Rangers organisation. Only the third to receive it, the other two being our other Californian friends – Randall Grahm (Bonny Doon) and Bob Haas (Tablas Creek). Very peachy nose. 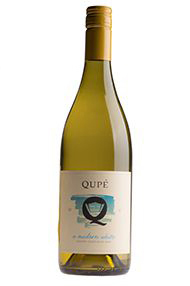 Rich and full at the front of the palate, gentle, and the freshness is more from the lightly grainy texture than from acidity. Pear-grained.